Since the ICO fervor of 2017, cryptocurrency and blockchain have become an international phenomenon, driving the digital economy movement. With public adoption on the rise, market research firm YouGov has conducted a study revealing recent statistics on cryptocurrency awareness. Market research and data analytics firm YouGov conducted a national survey, Aug. 29-30, that revealed that nearly half of millennials prefer cryptocurrency over fiat, according to data from YouGov Omnibus. The study further shows that 79 percent of Americans are familiar with at least one type of cryptocurrency. Of those familiar, only 71 percent recognized Bitcoin (BTC), which is both the most popular and largest cryptocurrency by market capitalization globally. Second to Bitcoin, the survey reveals that 13 percent of Americans know of Ethereum (ETH) and 12 percent are familiar with Litecoin (LTC), the seventh largest cryptocurrency by market cap. In the general population, men are seemingly more likely to be involved with or recognize cryptocurrency. 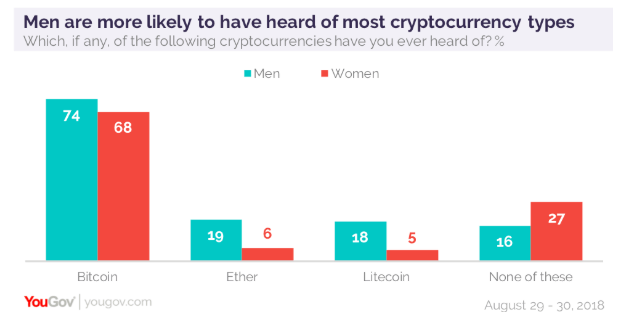 When asked if they’ve heard of any cryptocurrencies, 27 percent of women replied “none of these” while only 16 percent of men shared the same response. It’s evident that millennials have the greatest interest in cryptocurrencies, with 48 percent showing preference to crypto over fiat. Millennials also lead in the category of crypto mass adoption, as 44 percent believe it will become a prevalent, legal medium of exchange within the next decade. While support for mass adoption is seemingly on the rise, a near-equivalent amount of people (34 percent) do not believe cryptocurrency will become a common medium of exchange by 2028. The stigma surrounding cryptocurrencies often derives from its previous use for illicit activities, such as drug purchases online, and 25 percent of respondents still believe that cryptocurrencies are used more for illegal purchases than legal ones. While the stigma still exists, nearly one-third (36 percent) of people surveyed said they would be interested in primarily using cryptocurrencies rather than the U.S. dollar. Still in its early stages, cryptocurrency continues to proliferate among different generations across multiple industries. Only time will tell how these statistics will change as the digital economy evolves. The post Research: Nearly Half of Millennials Prefer Crypto Over Fiat appeared first on CryptoSlate.